These days, I love poking around boutiques and designer shops, either on the street or online, looking for unique garments and accessories that are comfortable, stylish and flattering. I’m not interested in anything too outrageous, mind you. My preference is for well-made clothing with subtle, yet original styling. So…when the folks at Ronen Chen asked me if I’d like to review a piece from the designer’s fall 2013 collection, I said: “Yes, please.” Ronen Chen’s fall collection features flowing, minimalistic dresses and separates in rich colors and soft fabrics—just the sort of fall fashions this over 50 woman is looking for. For my review, I chose the Adora Sweater (above and below). I was drawn to the sweater's unique “tuxedo lapel” and simple, open styling. Also, the description said it was made of soft, easy fabrics, which always appeals to me. And since I see no end in sight to my current “black and white” style fetish, a basic black sweater seemed like a “must-have” for fall. The sweater was delivered last week and I’m happy to report it fits perfectly, true to my size. It is well made in a lightweight, soft fabric. As a petite woman over 50, I am easily overwhelmed by too much heavy fabric, so I appreciate the cardigan's lightweight, gently flowing material. I also love the piece’s contrasting elements—the somewhat manly tuxedo-styling paired with the feminine draping. Here's a close-up view of the sweater to show how nicely it flows, yet keeps its shape. 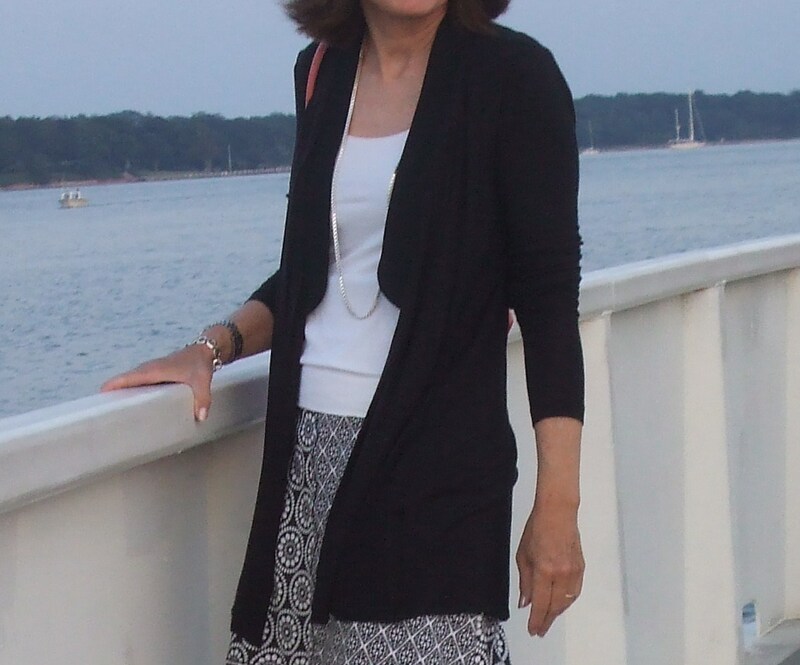 Two nights ago, I wore the Adora Sweater out to dinner on Shelter Island (on the east end of Long Island). The sweater was the perfect cover-up for dinner and kept me warm on the rather breezy ferry ride (photo at top of post). Stylish clothing is great, but stylish clothing that is also versatile is heavenly. As the ferry sailed across the bay, I realized the cardigan’s lightweight design makes it a year-round piece. It's a great work-to-evening out piece, but I love it just as much with a pair of jeans. The sweater’s quality and versatility make it a very good value. The Adora sweater’s appealing elements—the soft, flowing fabric and the simple, but unique styling—are seen throughout Ronen Chen’s fall collection. His love of architecture has apparently inspired the collection’s minimalist styling and monochromatic colors. Many of the pieces have asymmetric lines and/or simple, feminine draping. The collection features deep, fall hues, such as plum, mustard, and bottle green. If you’d like to view the entire fall 2013 collection or learn more about Ronen Chen, you can visit his online shopping site. The Israeli designer also has 20 "brick and mortar" concept stores (18 in Israeli and two in London). In addition, his clothing is sold in 300 independent specialty boutiques in America, Canada, Ireland, the United Kingdom and Holland. The Ronen Chen site offers a list of these boutiques with locations. There are quite a few shops listed in the New York area.